Exporter of a wide range of products which include pvc cling film. 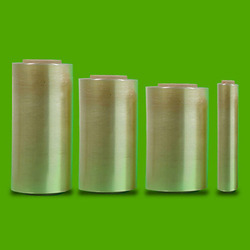 Application For wrapping foods such as vegetable, fruit, meat, biscuit, etc. We are engaged in offering a comprehensive range of PVC Cling Films, which are used in pallet stretch wrap and bundle over wrap. Our range has a unique property of sealing, which makes it more suitable for packaging, as it can be easily stretched across any product without the need of heat or adhesive. The high holding force and its unique flexibility enables the PVC wrap Film to cling tightly to objects. Offers in different grades as below. PVC Cling Film 300 mm x 30 mtrs. PVC Cling Film 300 mm x 100 mtrs.